CHAPEL HILL -- Dan Quayle is making a lot of noise these days about a motley group he calls the cultural elite. He knows they're liberals, mostly Democrats. But so far he has managed to identify only a few by name. There's Murphy Brown, the unwed TV anchor mom. And Lyndon Johnson, architect of the Great Society and the man responsible for the riots in Los Angeles 19 years after his death. Quayle might find the hunt for these elusive elitists easier in Chapel Hill, where Birkenstock sandals and "If you want peace, work for justice" bumper stickers are as common as crabgrass. The college town is North Carolina's answer to Berkeley, a California sanctuary for left-wingers, tree-huggers, granola-eaters and social apologists. Chapel Hill is such a bastion of radicalism that Sen. Jesse Helms wanted to put a chain-link fence around it and charge admission. Chapel Hill sells more copies of The New York Times than any other town in the state. With 137,000 listeners, its home-grown WUNC-FM is the most listened-to public radio station, per capita, in the country. The university's public television syndicate, now operated out of Research Triangle Park, is the most-watched in the state. And more people in Chapel Hill subscribe to The New Yorker magazine, per capita, than do people in New York. 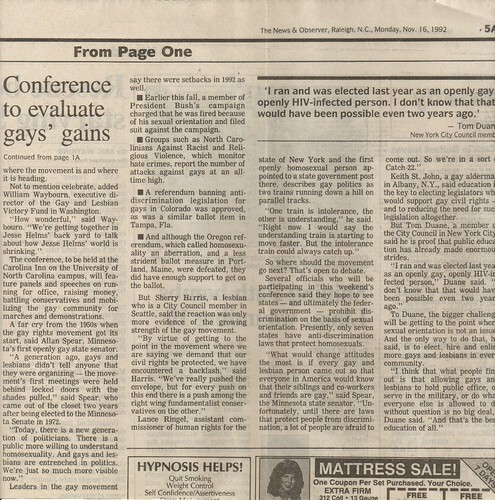 Chapel Hill was the first town in North Carolina to pass laws banning discrimination against gays. And it is home to the only openly gay elected official in the state. When the state re-elected Helms to the U.S. Senate, Chapel Hillians voted almost 5-to-1 for his opponent, Harvey Gantt. And during the Persian Gulf war, Town Council members actually considered making Chapel Hill a safe haven for conscientious objectors. 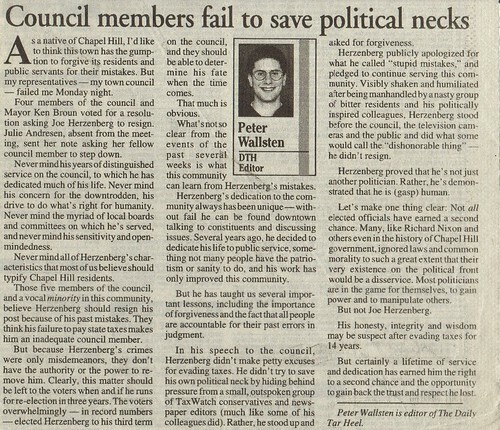 But Mayor Pro Tem Joe Herzenberg, the openly homosexual council member, said the point is moot, anyway. "I don't think the vice president even knows where we are."